Home » Health & Wellness Blog » What is LPG Body Massage? Developed by LPG Systems in the early 1990s, this body massage is a device that combines deep tissue massage with suction to restore the normal, healthy appearance of the thighs, buttocks, torso, and other parts of the body affected by cellulite. The treatment is approved by the FDA, but its results may not be equal to everyone. Called “endermolift” by some, this treatment combines two difference processes. A lipomassage that breaks up the cellulite and suction to remove the unnatural appearance of the skin affected by cellulite. In general, several treatments are needed before significant results occur. However, most people who undergo the treatment have reported positive results, which is why it has maintained its popularity. There are strong advantages to using this form of treatment compared to traditional methods, starting with the fact that it is non-invasive. This means that the skin is not punctured or cut such as in liposuction, so there is no recovery time after each treatment. Virtually No Pain: The deep tissue massage may cause the feeling of pressure on the muscles, but for almost all who experience it there is no pain. In fact, many find the treatment to be comfortable and even soothing, much like a traditional deep tissue massage. Works the Muscle Groups: The muscles underneath the cellulite will get a proper treatment thanks to the deep massage of the LPG device. For those who workout this will be a welcome respite which helps loosen the muscles, so they feel better. Effective: It is true that most people will see good results after several treatments. So, the system does work as advertised. For men and women who want the areas of cellulite reduced in their appearance, this is one of the simplest and best ways to achieve that goal. The downside is that it usually takes ten to twenty treatments before you really notice the results. This is why the LPG body massage is best used in conjunction with a healthy diet and exercise program to help reduce the cellulite even further. Keep in mind that the treatment itself does not remove cellulite, it only reduces its appearance. The fat cells never really disappear, but they are greatly reduced when combined with the proper diet and exercise program. If you are looking to reduce unsightly cellulite from your thighs, buttocks, and torso, then the LPG body massage may be for you. 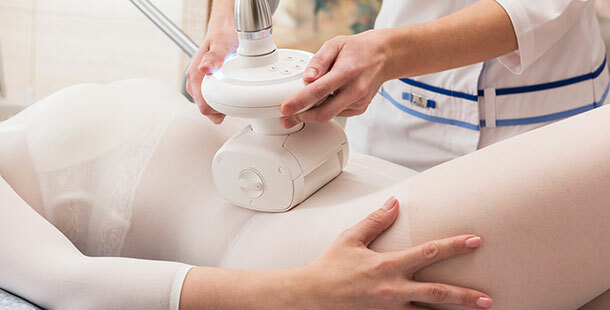 While the results are temporary, it is a safe, non-invasive procedure that can be used repeatedly as part of an overall approach to ridding the body of cellulite. ‹ How Do Aqua-Ionic Detox Foot Spas Work?